“My first ‘aha’ moment on the subject of animals, I’m afraid, wasn’t very profound. I was thirteen years old, tentatively chewing on a piece of chicken a neighbor had very lovingly prepared for my family. My younger sister, who knew exactly what was going through my head, looked at me impishly from the corner of the table and asked “enjoying the leg?” I put the piece of chicken down. I could no longer overlook the fact that I was nibbling on someone’s foot. From then I could only eat meats that looked least like the animal they came from – pepperoni pizzas, salami, fish sticks – but that too came to an end. Vegetarianism was a very personal thing for me. If someone asked why I was vegetarian, I couldn’t always answer. All I knew was I didn’t want to take part in killing or eating animals. My second ‘aha’ moment came when a close friend invited me to watch the documentary ‘Earthlings.’ I remember sinking into my chair and watching the film from behind cushions. The images were difficult to watch, but the sense of shame from what we put animals through for our interests was unbearable. Some questions began to nag at me: How are animals different from us and each other? How are they the same? What does it mean for an animal to have rights? And most of all, if animals can feel pain and suffering, sensations that humans work hard to protect themselves against, why shouldn’t considerations of compassion and justice also be extended to them? As I began thinking about these questions, I phased into making vegan choices. Thinking about animals, and practicing veganism has led me to examine the logic common to different forms of oppression: the objectification, commodification and exploitation of bodies, both human and animal. I recognize the privilege of being human, and I also recognize the privilege in being able to make vegan choices. Right now, I ‘m trying my best to work through both these privileges together. “AHA … I have had a few and each one is stronger than the last. My recent one is the clearest. For the first time I understand what it means to have “animal consciousness”: an integrated awareness of the systemic use and suffering of animals within our consumer driven world. There are ghosts at every corner, every turn. Looking back, I must have resisted this new consciousness in various ways … although it didn’t feel like resistance. Instead, it felt like I was outside looking in through a layer of glass. To dissolve that barrier I needed to fully engage in the content. Spearheading THE GHOSTS IN OUR MACHINE was imminent: it had been brewing for several years. I finally leapt in and it’s been full immersion ever since – as it always is for a documentary filmmaker, no matter what the subject is. The difference with this issue is that it confronts you several times, daily. For me, the AHA begins and ends with food. Food is the number one symbol of the AHA phenomenon because it is daily, personal, complex. When we can make the real connections we experience food differently. I became vegetarian 23 years ago after reading A Diet for A New America. Over the years I thought deeply about the issues – sometimes I craved chicken or fish, – I ate dairy and eggs. Sometimes I wavered and slipped up. But that’s because there are layers of AHA. As a new vegan I feel complete because something has dropped in, differently. I don’t want to contribute to the system of abuse anymore. “I realized that I had to stop eating animals when I admitted that I was eating my friends. My mum had 10 chickens at her property in the country and when I would sleep there I couldn’t wait to get up in the morning and see them. Spending time with these chickens allowed me to learn that they had desires, friendships, fears and joy, and a will to live. I knew this about non-human animals but had never spent much time with “food” animals, so there had always been a sort of separation between companion animals and food animals for me. One day, after playing with the chickens and even spending time in the house with them as they perched on my shoulder (they loved that! ), I came in to have dinner. Chicken. I had no mentors or infrastructure for giving up meat and becoming vegetarian. I didn’t know any vegetarians and my mum was concerned that this was an unhealthy choice. Some people have the realization and become vegetarian or vegan over night. It took me a while to do it, feeling I was going to have to give up so much. But as many who have made this decision already know, it’s liberating, it’s a relief to not be contributing to the death of animals who value their lives and do not volunteer their bodies for slaughter. It’s very disappointing to hear a meal-time grace that includes the words “and we thank this animal who gave its life for our nourishment”… When we eat animals, it’s because lives are *taken*, not *given*. Once I went vegetarian I got politicized about it. I signed up for vegan potlucks, animal rights film nights and went to Farm Sanctuary for my first internship where I became vegan on April 1st, 2003. A friend wrote to me this week, saying she had just adopted veganism. I’ll quote her words here because they are beautiful: “I’ve seen the light. Or rather, I’ve seen the darkness and am now running to the light”. At Farm Sanctuary I read all that I could, spent time with rescued animals and visited the stock yard. I’ve been seeing that darkness, documenting it, and bringing it to light ever since. These answers are so profoundly intimate and powerful. I am so grateful that these incredibly talented and compassionate women are fighting the good fight – it gives me hope and reignites my own commitment to stand up for what is right. There is an IndieGoGo campaign for this project that will end on 7/22. Any amount over their target amount will be donated to the We Animals Project. Two other team members have agreed to share their reflections about this project and what it means to them. Stay tuned for Part 2. My deepest thanks to David for graciously allowing me to post these articles on this blog. 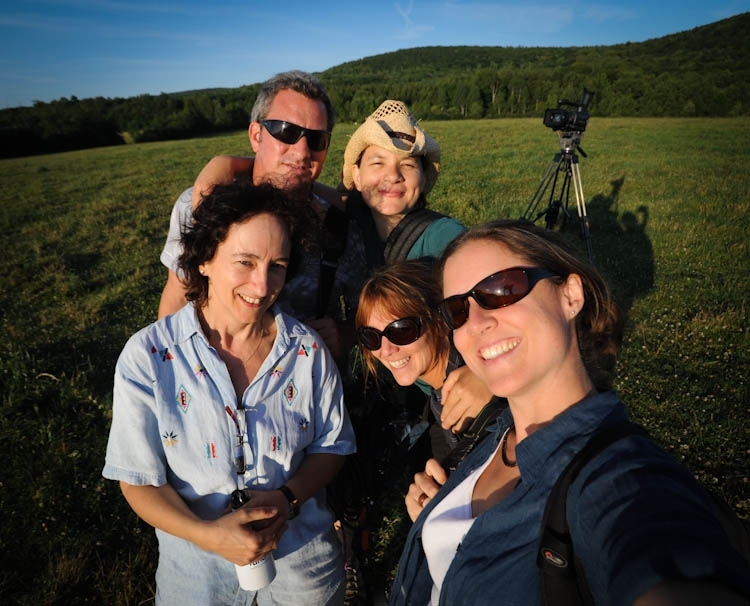 The photo in this post is a self portrait crew shot taken at Farm Sanctuary by Jo-Anne McArthur. How wonderful. I love the phrase that Ananya Ohri uses, “practicing veganism.” I have followed a vegan lifestyle for 15 years and often someone (usually an omnivore but sometimes a vegan) will ask, “But do you ever eat something cooked in butter at a restaurant by accident?” or “What about refined sugar?” Putting veganism in terms of a practice — like a spiritual or religious practice — makes sense to me. There are small slip-ups along the way (most of which are forgivable), but the intention is constant: not to cause others to suffer. Thank you for reading this post Jessica. I love what you wrote in your comment – “the intention is constant: not to cause others to suffer” – what an incredible world it would be if everyone held this belief. Thank you for the background on this project… I saw the photos of the dairy calf being thrown into the wheel barrow some weeks ago and have had Ghosts in our Machine on my radar ever since. The spectacular photography offers an insight into these being’s tragic lives that we can’t hardly imagine. Best wishes to this enterprise as it attempts to make more people awake and aware. Bea, I looked at those same photos this past weekend – I have not been able to get them out of my mind. To say that they are heartbreaking is an understatement. The team for this project consists of such amazing activists – it really gives me hope. Is there a non-Flash version of TGIOM? I’d like to view the site but am on an iPad.